Upon placing your order, you should receive an automatic email confirmation of your order. If you have not received this, please email kelly@lafromagerie.co.uk and we can check that we have your email address entered correctly in our system. Please check your order confirmation and confirm that all details are correct, including shipping method (Note that for ‘collect in store’ our checkout system still asks for your shipping address – please check the line under your shipping address to ensure it says ‘Standard Delivery’ if you do not intend to collect in one of our shops). Over the years we have been selling our cheese and gift boxes online we have improved and updated our methods, and hope we have covered all aspects of packaging and labelling etc. It is great that our cheese can be sent all over the UK as gifts or for your own enjoyment. However, even the best laid plans with advancements in technology and transportation as well as packaging, it is important to understand that cheese is a perishable food item, and shipping by courier does not come without some risk. Please read below for more information about our delivery process, how to store your cheese when you receive it, how to best enjoy your cheese, and ordering cheese as a gift. 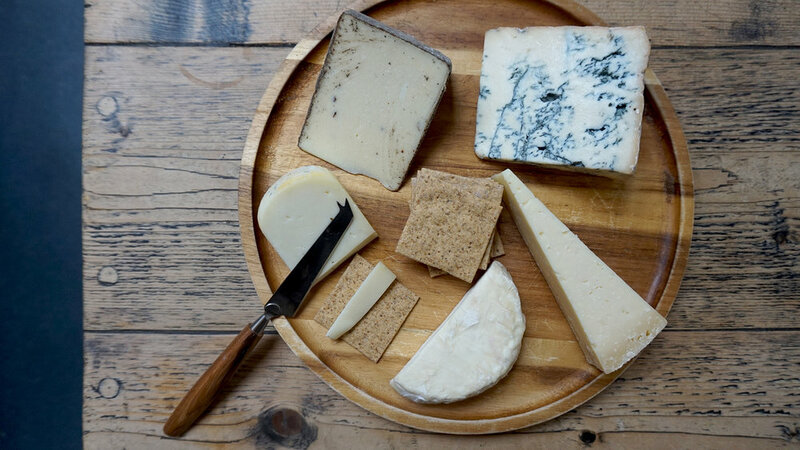 We ship our cheese boards & gift boxes anywhere in the UK using overnight DPD shipping – usually this means your order will arrive the next day after we process your order. For some locations further afield this may take an additional day - please email kelly@lafromagerie.co.uk with your postcode if you have any questions about this. Currently we do not offer shipping to Jersey or Guernsey. We ship orders to arrive Tuesdays – Fridays. If you do not select a delivery date at check out, we will deliver on the next available date. Please note: 8 AM is the cut-off time for us to process orders, any orders placed after 8 AM will be processed the following day. During warmer months we include an ice pack to help keep your cheese cool when it’s on the way to you. This pack may melt during transit but that is not a concern as the melting process helps keep the cheese cooler. Each of our cheese boards and gift boxes will be bubble wrapped and then wrapped in brown paper to protect it during transit. Our cheesemongers work hard to get and keep our cheeses in top shape, and it should arrive at your door in that condition. Upon receiving your order please open the packaging and take a look at your cheese. In the event that any items are not in the best condition please contact us right away, either by phone at 020 7354 8482 opt.1, or by email at kelly@lafromagerie.co.uk, and we will do what we can to rectify the situation. Kindly note however that upon delivery risk of damage or deterioration of the goods passes onto you, the buyer. Claims for damage will only be accepted within 12 hours of delivery. For deliveries in London we will by default use DPD as outlined above, although we can also use a local courier meaning we can deliver on Mondays and on some weekends. If you would like a local courier service, please lease email kelly@lafromagerie.co.uk with your delivery postcode and we can send you a quote for the courier together with a direct payment link. Vouchers, books, homewares and some non-perishable items may be sent via Royal Mail if not purchased in conjunction with any perishable items. Please note we do not have physical tickets for events, so we do not send tickets in the post. Cheese should be stored in the refrigerator in wax paper we provide when we send the cheese. The vegetable drawer is ideal – the fridge is more humid in the lower closed container. Please keep blue cheese separate from other cheeses – blue cheeses can be kept in the colder part of the fridge too and you may prefer to keep them in a Tupperware box with lid; or you may prefer to simply keep the cheese wrapped in the wax paper and then an outer wrapping of newspaper (the newspaper being a pulped product helps insulate as well as hold in the strong aromas of the cheese. To extend the life of harder cheese such as Cheddar, Gruyère, Beaufort, Comte, or other hard cheeses, keep the wax wrapping on the cheese or re-wrap with wax or greaseproof paper and placed in a Tupperware box lined with a damp Blue J-Cloth. Place a couple of sugar cubes in the box and seal with the lid. The sugar helps to regulate the moisture inside the box and keep the cheese fresher for longer. Before eating, set your cheese out of the fridge for up to two hours—or however long it takes to reach room temperature. We suggest putting the cheese still its wrapper on a platter or board and draping over a very lightly dampened tea towel then just before serving take off the tea towel and remove all the paper. When eating your cheeses, we recommend first trying them in ascending order of strength, starting with the goat cheese (typically the one with a fresh acidity, as well as a palate cleanser) and finishing with the blue (the most full bodied with steely metallic profile). The manner in which the flavours overlap encourages the most complete taste-sensations, and never leaves milder cheese eclipsed by more intense, complex-tasting ones. We understand wanting to surprise a recipient with a gift of cheese, but we highly recommend that you alert the recipient of the delivery date and that they should expect something perishable. If you provide the recipient’s mobile phone and/or email at checkout (in the shipping information or in the additional comments field) we will use that when booking your delivery with DPD. If you do not provide the recipient’s information, we will use the email and phone number you have provided for yourself. DPD will send the contact a text message and an email with information about your delivery slot, and you can also use this message to insert special delivery instructions. Please note that if you only want your contact details to be used then it is your responsibility to let the recipient know the item is on its way and the food contents are to be kept in the refrigerator. If you are ordering event tickets as a gift, please click here. While we design our Gift Boxes & Cheese Boards with seasonality in mind, products may occasionally be out of stock or unsuitable for shipping. In these instances we will substitute a product similar in both style and value. As your payment will have already been processed, no additional charges will be made. Kindly note we do not provide physical tickets for events. Please bring the automatic confirmation email (that you receive upon placing your event ticket order) - either printed or on your electronic device. If you are giving an event as a gift, please note we do not send anything to the recipient in the post, but please do let us know their name so we can ensure we have them on the attendee list. If you have any dietary restrictions, please make note of these at the time of booking and we will do our best to accommodate them. Please note that all of our events are non-refundable, although you can transfer your ticket to another person - if you are unable to attend and would like to transfer your ticket, please let us know the name of the person who will be attending in your place. If you have not received your automatic confirmation email after purchasing a ticket, or if you have any questions about the event, please message kelly@lafromagerie.co.uk. We have two types of vouchers available through our web site - physical vouchers which can be used in our store (these are paper vouchers which can be purchased in our shops or over our web site) and online gift cards, which are sent via email and can only be redeemed online. Both vouchers are available to purchase online here. We can only accept returns in the event that non-perishable goods are in saleable condition. The cost of postage is the buyer's responsibility; we urge you to get proof of postage in all cases. We will reimburse you the cost of the item upon its arrival to our shop. Please note that for event tickets purchased online we cannot process refunds after the purchase of a ticket, although you may transfer your ticket to another person if you are unable to attend. If you would like to transfer your ticket, please email kelly@lafromagerie.co.uk. If you have received items in error please contact us at 020 7354 8482 opt. 1 or kelly@lafromagerie.co.uk and we can arrange a courier to exchange items. Subject to the above, kindly note that substitutions within orders do not apply (see substitutions section in the Terms of Service).